Ever wonder what the big deal is about Sisters and Nuns wearing a full Habit? You might even think, what difference does it make? Well, first of all, it is an outward sign of that individual’s self-giving to their Spouse, renouncing all that the world offers. There is no longer need of makeup, jewelry, worries about hair styles and fashions. Being a Sister, nun, monk or friar is a life time commitment to Christ alone. That being said, it seems these days that that has been tossed by the wayside by many Orders, not even being able distinguish the members of their Orders from the common laity. Personally, I miss seeing the different beautiful habits of the many Orders. It’s like when a child, I could tell one car from another and now they all look the same or indistinguishable to make or model. 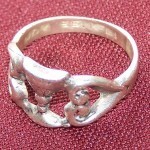 Each Habit has a meaning, a history and the desire of the founders that the Habit be worn by the members until the end of time. Below are some of different Orders , male and female, that still wear the traditional Habit and you will see each and every article has a meaning. Why do the Handmaids wear red? Precisely, why do they wear wine-red? And white veils? What do the symbols of the habit and veil mean? When their Founder, Father Gerald, penned his poem, “Crimson Robes” , he had in mind both the crimson robes worn by the Crucified Christ as well as the garment he had in mind for his spiritual daughters, the Handmaids of the Precious Blood. Father Gerald stipulated that he desired his Handmaids to dress in the wine-red color symbolic of the Precious Blood of Christ shed for our salvation and the white veil symbolizing the white Host of the Eucharist. Although slight variations have occurred in over the past 70 years plus history, Handmaids have always worn a full habit and full white veil. All Handmaids, novices and professed, wear a white veil. The Carmelite monk, like a soldier, is clothed in the armor of the habit as he bravely does battle for God and for souls. Although the Holy Scapular is the habit properly speaking, each article of the monk’s clothing has been entrusted by Holy Mother Church with a significance that urges him on to the heights of holiness: mystical union with God. The habit of the Carmelite monk is made of durable brown wool as woven after the manner St. Teresa of Jesus first taught her daughters. Brown like the cross and the soil of the earth, the Carmelite wears a robe of brown, since he is called to carry the Cross of Our Lord, Jesus Christ and to imitate the humility of the Blessed Virgin. The monastic tunic, commonly known as a monk’s robe, clothes the monk in modesty. Although not commonly known, tunics were the garments worn by men throughout history until modern times. Now however, the tunic stands as a sign of contradiction to modern fashion and the vanity of the world that the monk leaves behind when he enters the monastery. When a monk is clothed in the tunic at the time of his Investiture in the Holy Habit, the suit coat is taken off and in its place the prior invests him in the tunic. 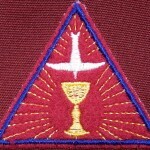 While doing so, the prior prays, “May the Lord clothe you a new man, who is created according to God in justice and holiness of truth.” Indeed, the tunic is ultimately this: a sign of the new man who has renounced the world that he might be united to God and bring God to the world through his life of prayer and penance. Ss. John of the Cross and Teresa of Avila when instituting the Discalced Reform of Carmel in the sixteenth century prescribed a return to the poverty of the original hermits on Mount Carmel. This poverty was manifested in many ways, but one of the best-known ways was that the Discalced Carmelites did not wear shoes. The word “discalced” actually means “barefooted” or “shoeless.” Although originally the Discalced Fathers did not wear shoes and went about barefoot, St. Teresa of Jesus moderated their austerity by urging them to wear poor sandals. 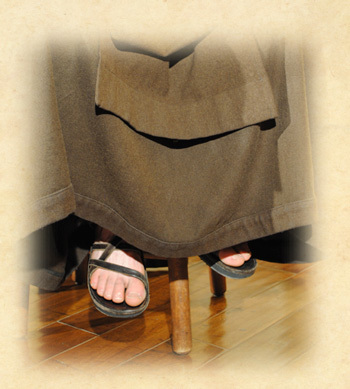 The Carmelite monks in seeking to imitate the purity and wisdom of the Carmelite life, prescribed by these great saints, wear poor leather sandals crafted by their own Brother Cobbler. Through the winter and cold months, the sandals are especially a reminder of the poor, and those in our society who are truly cold and without protection from the harshness of winter. 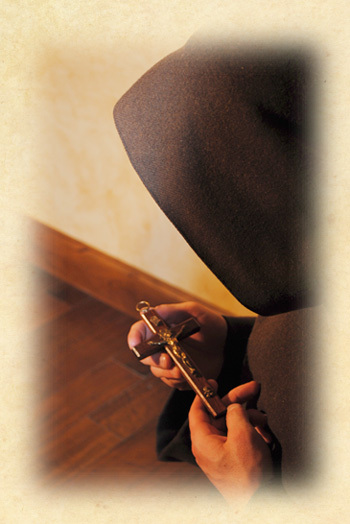 The Carmelite Monks are conformed more perfectly still unto Our Lord whose poverty in this world was real and chosen. The Scapular is truly the “garment of salvation”, although it is humble even in its appearance. The scapular can best be recognized as the brown rectangular piece of fabric that hangs down the monk’s front and back, covering the tunic and hiding the monk’s hands folded beneath. Until Our Lady of Mount Carmel appeared to St. Simon Stock in 1251, the scapular was worn by many and varied religious orders as an apron to protect the tunic when working. 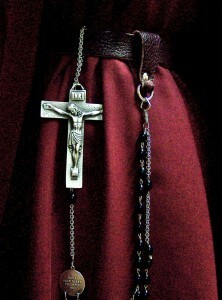 It can be said that the scapular was the least important garment of the habit, a garment of work, a garment of a slave. And yet, the Blessed Mother offered the Scapular to St. Simon Stock in response to his prayer for a privilege and as a sign of Her particular love for the Order of Carmel. In the gift of the Holy Scapular, we see Our Lady’s humility: she is truly the Handmaid of the Lord, so how appropriate it is that she gave to Her Carmelites the garment of a slave as their privilege. 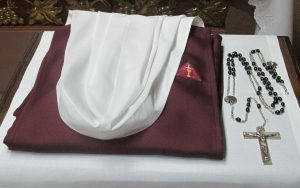 At the reception of the Scapular, which is simply the making of a Carmelite, the prior urges, “Take up the sweet yoke of Christ, and his light burden.” The Scapular is a constant reminder of the Cross borne by Our Blessed Lord for it shares its brown color and both are borne upon the shoulders. In this conformity to our Savior, we first conform ourselves to Mary and the “burden” becomes utter sweetness. The Scapular, long venerated and upheld by pope after pope, is indulgenced and its promise is protection from hell’s flames. The Carmelite monks, seeking to distinguish themselves from other Carmelite religious, wear the Scapular over the cowl. It is interesting to note that St. Teresa had her daughters wear the Scapular as the top vestment worn by her daughters as well, centralizing the role of the Brown Scapular in the Carmelite Habit. The cowl (sometimes known as a capuche, especially for friars) is the hood worn by the Carmelite monks. The monk wears a monastic cowl that hangs over his upper back and is used to cover his head during the winter months. Although the cowl serves a practical purpose in keeping the monk’s shaven head warm, the cowl is more importantly a sign of mourning. The word “monk” is derived from Greek words meaning “one who mourns in solitude.” So what does a monk mourn? 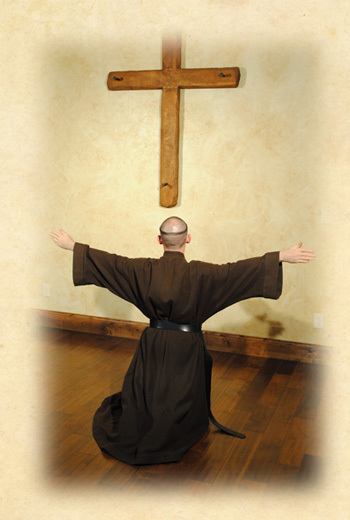 The Carmelite monks mourn for their own sins and the sins of others, begging for God’s mercy and justice. The cowl is a reminder of Christ’s Dolorous Passion on Calvary for sinners, a death that He would have endured had there been but one poor sinner. The Holy Rule exhorts the Carmelite to “place the helmet of salvation on [his] head,” and this is what the Carmelite does every time he covers his head with the cowl. His head being covered in the brown wool and his face hidden unless you look directly at him, the monastic cowl also serves to hide the monk so that God alone might know his countenance. A shaven bald head has been continually identified as a sign of a man’s consecration to God and complete offering of himself to the service of Christ and His Church. We read in the Fourth Book of Kings that forty-two young boys of Bethel who had been raised with a prejudice against the true religion and its ministers mocked St. Elisha, the disciple of St. Elijah. And how was he identified and mocked? The boys said, “Go up, thou bald head; go up, thou bald head.” Here we see that a bald head was a contradiction even in those days before Our Lord’s life on earth. And still today the bald-head is a contradiction to the world’s fashion and haircuts. The Carmelite monks wear the tonsure as yet another reminder that they have confounded the wisdom of the world and chosen instead the wisdom of the saints. The tonsure is a penance, too. In the cold of winter a bald head, like feet without shoes, is a penance. The monks embrace this opportunity to show obedience to the Church and the monastic tradition. The priests and seminarians of the monastery have a thin crown of hair however, commonly called a corona that circles their heads as a reminder of the priestly dignity and duty. In a vision, Blessed Angela de Arena saw Our Lady of Mount Carmel and the saints dedicated to Her during their lives, but Bl. Angela saw no Carmelites. Asking the Blessed Mother where the Carmelites were, the Queen of Heaven pulled back Her white mantle and hidden below were Her Carmelite saints appearing as roses. The white mantle worn by Carmelites is an extension of the mantle of Mary where she protects and hides souls that have recourse to Her. reminder not only of the purity with which the monk should approach God, but also that the monk should approach God clothed in the virtues of the Immaculate Mother. A monk when making his temporary profession receives the Profession Crucifix, which is worn upon the heart by being attached to a buttonhole on the tunic. The Profession Crucifix with its cross of wood and metal corpus is an outward sign of the conformity to Christ, which is sealed in the profession of the Vows of Obedience, Chastity and Poverty. Worn over the heart, the Profession Crucifix is also a reminder that the monk has nowgiven his heart to Christ in immolating himself for the love of God and the salvation of souls. As one hymn proclaims, “Hail, O Cross, our only hope.” Indeed it is this very cry that must gush forth from the professed monk’s heart as his prayers challenge the world to embrace the Cross of Christ and to stand at the foot of that infamous gibbet with theBlessed Mother, St. John, St. Mary Magdalene and the others gazing up at Him whom we have pierced. More marvelous still, the Profession Crucifix is hidden below the Scapular and not outwardly visible; this too ought to inspire the Carmelite to hide his sufferings, his little crosses, that God alone might know them. 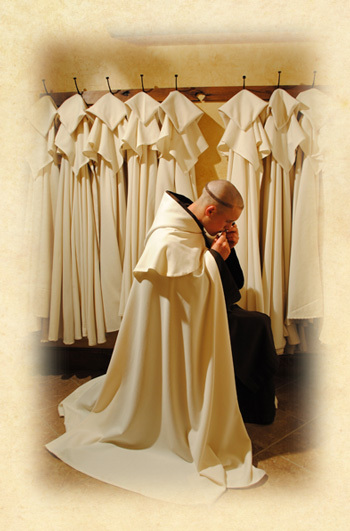 In order to safeguard the poverty of the monastic life, each monk is permitted to two choir habits, a work habit, and a modified work habit to be worn as needed. It is permissible in hot and humid places to allow another brown material to be substituted for wool. It is our charism that all the monks should be engaged in manual labor according to the Holy Rule, ” you must do some kind of work, so that the devil will always find you occupied.” As much as we love our woolen habits, they are not durable enough to withstand the abrasiveness of hard manual labor. To combat this, monks and nuns have always had a specific habit for work that looks similar to their choir habits. Following this very practical tradition we have designed a work habit of our own. 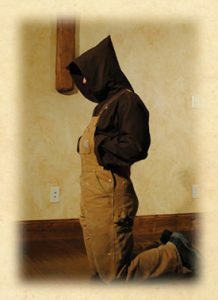 In our work habit we have retained the capuche and scapular but have replaced the wool tunic with one made of a canvas material similar to Carhartt. This canvas material is much more durable and holds up well as the brothers carry out the chores of the monastery. Our Holy Mother St. Teresa of Jesus always taught her daughters to keep their habits neat and clean. The brothers therefore, by having work habits, keep their choir habits in a condition suited for Mass and the Divine Office. For more serious work like running equipment or branding cattle, the brothers wear overalls with the monastic capuche. This garb is dubbed the “extraordinary work habit” and it serves as a protection for the brothers’ safety during serious work. The work habit serves as a powerful reminder to the monk that his work too is consecrated to God through the vows. This reality keeps the monk focused on the spiritual realities always before him and reminds him continually of his mission to generate love within the heart of the Church. Thus the monk strives to sanctify the entire day, even at work periods, by uniting his labor with prayer. St. Albert, the legislator of the Carmelite Rule, prescribes that the monk’s “loins must be girt with the belt of chastity.” The cincture is just that, a leather belt that the monk ties over the tunic at the waist. How prophetic are the words spoken by the prior when the monk receives the cincture, “When you were younger, you would gird yourself, and would walk where you willed; but since you will be older, another will gird thee.” This mysterious “another” is the Blessed Virgin whom the monk takes not only as his Heavenly Mother, but also mystically as his sister and greatest love among men. In imitation of Our Lady’s virginal purity and that of St. Joseph, the monk girds his loins in chastity. The Carmelite does not marry or have natural children that he might have instead as spiritual children all the souls whom God places before him, both known and unknown. 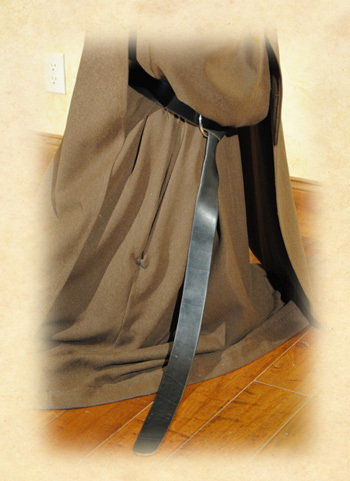 The Carmelite monk’s cincture hangs on the right to the bottom hem of his tunic. On the left from the cincture hangs the Most Holy Rosary. The monk has his spiritual weapons around his waist; like a cowboy or a soldier, the Carmelite monk must always be prepared for spiritual warfare with the virtue of holy purity and the power of the Rosary of the Virgin Mother. The belt around the waist represents binding in the virtues together with love, which makes them perfect. It also represents chastity, mortifying and subduing the selfish desires of the flesh and heart, and integrity and self-control. The biblical phrase “gird up your loins” refers to pulling and tying up the lower portion ofa garment to prepare for action. A Carmelite should always be ready to take action in the name of the Lord. The scapular is a cloth that hangs over the shoulders, covering the chest and back, it represents work and being a handmaid of the Lord. Carmelites should always be ready to serve the Lord. The Blessed Virgin Mary is our example of a servant of the Lord in her great hidden work of raising Jesus. Originally the scapular was a work garment, like a smock or an apron. Carmelites should be prompt in carrying out the Lord’s work, give themselves to work of some kind, and never be idle. Since the earliest days of the Order, Carmelites have been devoted to the Blessed Virgin Mary. The habit, particularly the scapular, is a symbol of Mary’s special protection and desire to clothe us in Christ. Our Lady of Mt. Carmel is usually depicted wearing the Carmelite Habit. It is truly a privilege to wear the Carmelite Scapular. Devotion to the Carmelite Scapular is very popular among the laity, and there are many scapular confraternities. The veil is the sign of the nun’s consecration. “You put the veil on and you know you belong to (God), You are not your own.” The veil and coif cover the nun’s hair, which the Scriptures call a woman’s “adornment,” to protect her from vanity and to remind her that she is given fully to God. 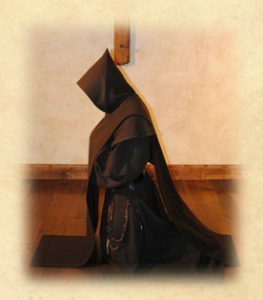 Benedictines wear black tunics, both as a sign of penitence and because it was the cheapest fabric in the fifth century, when the Italian St. Benedict founded the order, the oldest in the Church. 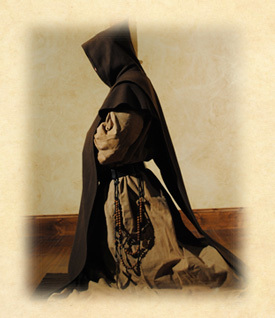 In 12th century Italy, when St. Francis of Assisi left his life of privilege for one of poverty and preaching and established the Order of Friars Minor, he took on the clothes of a penitent: a hooded brown robe in the shape of a cross tied with a cord around the waist. Capuchin Franciscans who reformed the order 300 years later to return to the ideals of simplicity and prayer that had been lost over the years, continue to wear this same habit today. A Capuchin’s cord, is tied with three knots that symbolize their vows to observe the evangelical counsels of poverty, chastity and obedience. Religious life is an eschatological sign, it is pointing us to the fulfillment, the coming of the kingdom. It’s important that we make that visible by our action, our ministry, our prayer, and by what we wear. Here are just a few examples of the major Orders and what their Habits mean in their religious life. People just don’t understand the gravity of the religious “hidden” life. Some Orders have modified habits and some don’t wear habits at all. If you were to see some of them walking down the sidewalk, what would give you any indication that they are even a Sister? They dress like office personnel or lumberjacks. Maybe they wear a lapel pin or a little cross on a chain. Those in religious life are to stand out, like a Zebra in a pack of Cheetahs. Sisters, nuns, monks or friars should have an aire of nobility because they are the Brides of Christ. Their lives are prayer and sacrifice, which this world and Church are in desperate need of despite what Bergolio says. I was day dreaming one day about all the different religious habits and how wonderful it would be, if the habits were able move about as if occupied by a human body. Every time a habit would pass by, there would be a beautiful smell that would linger in the air, the aroma of pure sanctity, ahhh, what a wondrous thing that would be. The following excerpt was written by Fr. Nicholas Gruner in the Fall of 2010 for The Fatima Crusader. It is a very timely message that we all need to listen to, and pay close attention to his explanation regarding “False Obedience”, especially with the current condition of the Church and the World. “As goes the Church, so goes the world”, and both are in chaos. Since Vatican II there has been an unprecedented division of the Church into warring camps that hoist their respective flags behind impenetrable fortifications. The emergence of these camps is the direct result of the supposed “new orientation” of the Church since the Council – a mirage, of course, but one that has provoked terrible damage in the Church. The very existence of a previously unheard-of distinction between Novus Ordo and “traditionalist” Catholics tells us that the “refoms” of Vatican II have caused a disastrous quasi-schism within the Church itself. The imposition of these novelties upon the Church – and with it, “official” opposition to the Message of Fatima – has depended precisely on a false notion of obedience to ecclesiastical authority. None other than the present Pope himself (Benedict XVI) exposed this false notion when he was still Cardinal Ratzinger. “The pope is not an absolute monarch whose will is law, but is the guardian of the authentic Tradition, and thereby the premier guarantor of obedience. And what is true of the Pope – that his power and authority are limited by the obedience of faith – is all the more true of his subordinates. Yet, in their ranks, the obedience of faith has widely been replaced in the post-conciliar epoch by obedience to their authority for its own sake. Positivism (my will is law) and nominalism (what I will is good because I will it) have invaded the Church, cloaking their abuses in the virtue of obedience, which seems to have become the only virtue insisted upon by ecclesiastical authority. It is no coincidence that this invasion of the Church by positivism and nominalism coincides with “the invasion of the Church by worldly thinking” that Paul VI lamented – but too late, for the “opening to the world” had already begun to inflict its incalculable damage, and the “smoke of Satan” he also belatedly lamented had already entered the Church through the “fissures” he noticed only after the smoke had entered. Indeed, all authority is derived from divine authority, for if there were no God, there would be no ground on which any man could stand to assert authority over another, but only various “social contracts” resting on “consent.” All authority on earth, both temporal and spiritual – from the parent to the policeman to the politician, from the priest to the prelate to the pope – is ultimately derived from divine authority. All those who exercise authority of whatsoever kind, even papal authority, must exercise that authority in conformity with the divine will. And all who obey authority of whatsoever kind must obey divine authority first. The failure to recognize and acknowledge the obedience which is absolutely due to God above all human authority is what is wrong with the modern notion of authority. It accounts for the moral, political, and social chaos of our time. And that same chaos, as Paul VI lamented too late, has infected even the human element of the Church, producing the paradoxical situation of demands to respect “authority” that contravenes the very basis of all true authority: the divine will for man. Now, since all authority comes from God, we obey men because – and only because – their authority ultimately is based upon God’s authority. And this obedience, where it does not contravene God’s law, is actually an act of justice – of giving to another, and ultimately to God, what is due. But God does not give any man the authority to command, nor anyone the right to obey a command, that contravenes the commands He has given us, including the Decalogue and the law of the Gospel, which is the “positive law” of Christ the King. Moreover, all authority on earth is limited by God’s decree. Not even the Pope has unlimited authority. We know the limitation of the Pope’s authority by Revelation, Scripture, Tradition, and the teachings of the authentic Magisterium, both Ordinary and Universal, as well as the Extraordinary Magisterium in its dogmatic definitions. As St. Augustine says, “God is order”. Therefore, there is a hierarchy of authority. The command of the higher authority – when he is within the ambit of his jurisdiction – supersedes the command of the lower authority. There is a hierarchy of angels, a hierarchy of being in nature and a hierarchy of authority in the Church. Our Lady’s authority after that of Her Divine Son, is the highest authority in the Church and the world. It must be noted that the Blessed Virgin Mary, as Queen of Heaven and Earth and Mother of all the living, has real maternal and royal authority over each one of us, every member of the human race, and particularly every Catholic, including each and every priest, bishop, and Cardinal, and finally the Pope himself. On October 13, 1917, the Queen of Heaven and Earth commanded the sun, and even the sun obeyed Her. So must all Her children, no matter what their rank in the Church. The Message of Fatima, with its prescriptions for the Church, is precisely an exercise of Her authority over the entire Church, the Pope included. It is impossible for the sinless and ever Virgin Mother of God, possessed of the Beatific Vision in a unique and unequalled way, to abuse or exceed Her authority. Therefore, when She commands, we must obey. Even the Pope must obey Her. Hence obedience to the Message of Fatima, which means obedience to the Mother of God, is subsumed under the concept of obedience of faith binding even the Pope to act for the faith, for the salvation of souls, above all else. Which brings me to the question of the Third Secret in particular and its relation to the problem of false obedience. But the Vatican Secretary of State, Cardinal Bertone, continues to maintain the fiction that the “not easy to decipher” vision of the “Bishop dressed in White,” which has received a welter of conflicting interpretations, is all there is to the Third Secret of Fatima. He steadfastly and most tellingly refused to inquire of Sister Lucia regarding the momentous “etc” even though he had every opportunity to do so over the five years of controversy that raged from the time the vision was published in 2000 – to widespread skepticism about the completeness of the Vatican’s disclosure – until Sister Lucia’s death in 2005. Or perhaps he did inquire and is in possession of information he has deemed expedient not to reveal. According to Mr. Borelli the answer is: simply and only because a human authority will have it so. And a human authority, moreover, who has no authority in the matter, as the Vatican Secretariat of State is a creation of men not God, and is in no way part of the divine constitution of the Church. Indeed, Pius XII dispensed with the office during his pontificate. It seems more than probable that the very catastrophe the future Pius XII foresaw is predicted in great detail by the words of the Virgin of Fatima to be found within that troublesome “etc.” But the partisans of false obedience argue that we must put the matter out of our minds to suit the wishes of Cardinal Bertone and all those who have no authority to conceal any part of the Message of Fatima. Doesn’t Father Gruner explain quite well the concept of False Obedience? Do you see the correlation of what he said and what’s happening in the Church today? It seems those who have no authority have taken upon them ALL AUTHORITY to suit themselves. This seems to be true from John XXIII to Pope Benedict XVI, allowing for a second pope, (Bergolio), who makes new rules, names new sins that are in no way mortal sins, removing sins that have always been sins, creating a new (his) magisterium. These things all go against God’s law that He has set down and Christ established when He founded His Church. There is no obedience of faith, only obedience to the man who has stated his own law and that’s all that matters at that time. Obedience to the Blessed Virgin doesn’t matter to those who follow their own ideas and wants. A completely new church has been established with Vatican II. It is a false church, an ape church, and definitely not the CATHOLIC CHURCH. It adheres to “false obedience” usurping the true traditions and dogmas. Oh yes, and those of the hierarchy and clergy like to think they are speaking in Catholic terms, but they are not, deceiving leading more and more souls away from God down a path that leads straight to hell. It’s like a pile of dung covered with whipped cream and colorful sprinkles; it may looking very inviting, but underneath, it is still a pile of dung. Members of the clergy need our prayers, some for total conversion, others to be rescued, and courage for the many who are trying desperately to hold on to the Truth. Don’t you think it is about time that we who want to stay close to God in all things, should start being obedient to Our Queen: pray, fast and sacrifice – in order to bring about the request of consecrating Russia to Her Immaculate Heart? We have nothing to lose – oh, but we do, our very souls and those of our neighbor. It’s like choosing life or death. Think about it. Do you choose to be obedient to the true teachings of the Catholic Church (to gain eternal life), or do you just want to go along with the “ape church” (to gain eternal death)? It’s that serious! This is a real life and death situation we have here and you have to choose. The Blessed Virgin is not going to hold back the Hand of God much longer. The chastisement is going to come and many souls will be lost forever. She has warned us and has tried to help us. Listen to Her, be obedient and pray, pray, pray the Rosary every day, fast, make sacrifices. Your soul matters doesn’t it? What about the souls of your family and friends, don’t they matter as well? Encourage them to pray, fast and sacrifice too! Buckle up and hold on tight, the ride is going get very rough. Here are two articles that are a must read and deal with the current situation in the Church, and, they also help explain even more about this “false obedience”. Both of these articles are well worth the read. Life is short and death is sure, the hour of death remains obscure. A soul you have and only one, if that be lost all hope is gone. Waste not your time while time shall last. For after death ’tis ever past. Or heaven or hell your destiny. Have your entire family gather around and listen. I will not provide the name of the priest(s) for their protection and so as not to destroy their "hidden in the Garden" as religious so like to remain. but also spread her graces far beyond the village. nine, the child contracted typhoid fever, which brought him to death’s door. After forty days of near-unconsciousness, he was cured as though by a miracle. would often emphasize the role of the Holy Spirit in the life of the Christian. a serious matter. You belong to Jesus Christ.” Nevertheless, several boys left. of them back. But it all remained precarious. crying, to the point that the expression “crying the little prayer” was coined. gift we receive through prayer. feat of Our Lady of Holy Hope was celebrated very simply, but with great joy. baptism buried in their hearts reappeared in all its freshness and strength. invocation Our Lady of Holy Hope, convert us! Before and after it. Holy Hope would begin to be published. had disappeared from Mesnil. Conversion was also reflected in modesty of dress. together the most committed women in the “Society of Jesus Crowned with Thorns”. confession. In the end, he became a monk at the Abby of La pierre-qui-Vire. reveals herself as the all-powerful converter, the queen of hearts. and the parish nevertheless remained very much alive. thanks for these blessings and to ask that these fruits continue. make us witnesses and apostles of the Hope [that] does not disappoint!